Jonathan was born to Kyle and Joanna Colburn in November 2347. Both his parents were Starfleet officers and at the time of his birth was stationed at a research lab in Sussex, England. He spent the first few years of his life with his parents in England, but when they were both transferred to a Starship, the USS Melbourne, they wasn’t sure about bring up their son and future children in such a cramped enviroment so asked Kyle’s brother Jonah and his family to look after Jonathan until they could transfer back to Earth based assignments. Jonathan found the transition hard, moving from England to New Berlin on the moon, where his Uncle and Aunt lived. But, in time it began to feel like home. He was embraced and warmly welcomed by his extended family but dreamed of his own parents returning. Unfortunately, this didn’t happen as they were both still aboard the Melbourne when it was called into action against the Borg at Wolf 359. The ship was lost with all hands in the engagement. Jonathan came to terms with his parents loss quickly, which worried his Uncle and Aunt. He through himself into his schooling so he too could wear the Starfleet uniform, the same as both his parents. Aged 17, he joined the academy and excelled in security, tactical and diplomacy. Jack, the nickname his Uncle and Aunt gave him, graduated Starfleet academy in 2368, aged 21. His first assignment was part of the security detail at the Federation embassy on Qo’noS. Where he gained good experience in both Security and Diplomacy. In 2372, the Klingon Empire pulls out of the Khitomer Accords and all out war begins with the Federation. The Embassy was given an hour to evacuate. 30 minutes later Klingon troops entered the Embassy and a fire fight ensued, leaving most of the security detachment dead. Luckily, Colburn was part of the team that protected the Ambassador and managed to get him to the Runabout and leave. Jack was reassigned shortly after returning from Qo’noS to the starship Sapphire, a excelsior class starship, as a tactical officer. The Sapphire patrolled the Klingon board with Starfleets 4th fleet. The 4th fleet engaged the Klingons numerous times and took heavy losses. During the last engagement the Sapphire took extensive damage and was retired from service. With a promotion to Lieutenant Junior Grade, he was transferred aboard the Thunderchild, as her assistant chief tactical officer. Shortly after they left spacedock from the Thunderchild’s refit, they were ordered to stand with the fleet against a new Borg threat. He could wait to face them in battle. During the battle with the Borg cube, the Chief Tactical Officer was killed and Colburn took his place. Thunderchild was part of the final assault on the Cube under the command of Captain Picard and the Enterprise-E.
Jack hoped to keep the Chief position aboard the Thunderchild but the Commanding officer though he was still too young and inexperienced to take on the roll. He served with distinction during his time aboard the Thunderchild through the beginning part of the war with the Dominion. In 2375, he was transferred to the IKS Ki’tang as their Chief Gunner, as the ship was short handed for the second battle of Chin’toka. The IKS Ki’tang was the only allied ship to survive the major encounter with the new Dominion-Breen fleet. Due to a warp core containment problem which Jack helped the Ki’tang’s Chief Engineer solve with an adjustment of the tritium intermix. Jack spends the rest of the war on board the IKS Ki’tang, and is involved in most of the major victories towards the end of the war including the final battle. After the war, the Klingon Defense Force asked Colburn to stay with them while they recruited more officers, but he declined the invitation in favour of heading back to Starfleet. Given a promotion to full Lieutenant, he was then assigned to the new embassy on Cardassia and put in charge of the security detail. He spent a few years helping to rebuild Cardassia. He helped train the new Cardassia Governments security forces as well as liaise with the military. In 2386 he was promoted to Lieutenant Commander and assigned to Deep Space 3 as the new Chief of Security and second officer. He enjoyed his time on DS3 and enjoyed the challenges that command gave him. 2368 – Graduated Starfleet Academy, assigned to the Embassy on Qo’noS. 2372 – Assigned to the USS Sapphire, tactical officer. 2373 – Assigned to the USS Thunderchild, assistant Chief Tactical Officer, promoted to Lieutenant JG. 2380 – Promoted to Lieutenant Commander. 2386 – Assigned to Deep Space 3, Chief of Security and Second Officer. 2388 – Takes command of the USS Kumari. Promoted to Commander. 2366 – Approached by Starfleet Intelligence to become an agent. 2368 – Assigned to the Embassy on Qo’noS due to Starfleet Intelligence hearing rumours about changes in the Klingon Government. 2372 – Starfleet Intelligence releases Colburn to Starfleet due to war with the Klingons. 2375 – Starfleet Intelligence reassigns Jack to the IKS Ki’tang in order to keep an eye on the Klingons fleet deployments. 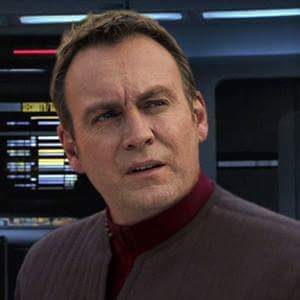 2375 – In order to keep informed on the goings on with the new Cardassian governement, Colburn was assigned as Chief of Security to the new Embassy on Cardassia Prime. 2386 – Colburn was sent to Deep Space 3 to relay first hand information on the Breen.